Same Day Tooth Replacement With A Dental Implant in McKinney, Allen, Frisco, Melissa, Anna, Prosper, Texas. If you know you are about to lose a tooth, or if you have suddenly lost a tooth, there may be a chance that you can get your tooth replaced with an ‘immediate’ dental implant! Come and talk to us before your tooth comes out as this will maximize the chances of an immediate implant being possible. If you have just lost a tooth (for example, as a result of a sporting injury) it may well be possible to put an implant tooth in immediately. You should act quickly though: it only takes a couple of days for the gum to grow down into the socket – and this will make it difficult to put an immediate implant in place. The gum and surrounding area must be infection free. At the initial consult appointment, Dr. Chang or Dr. Tatum will perform an intraoral examination and order a 3D CBCT to determine if you are a candidate for immediate dental implant placement. Using this advanced imaging technology, doctors can evaluate your bone volume, gum, and implant placement virtually. This will improve the success rate of immediate tooth replacement significantly. If both these conditions are met, then it is possible to carefully extract the root and immediately put an implant directly into the tooth socket. 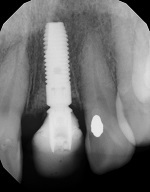 If the implant is sufficiently secure in the bone we can also put the titanium post in place and put a temporary crown on top. This treatment means that the patient can literally come to the clinic with a failed tooth and leave a short while later with a new implant tooth in place. 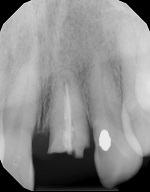 Immediate dental implant was inserted after tooth was removed. A temporary crown was attached to the implant the same day. The temporary teeth look very natural and stay securely in place until the implant has healed sufficiently to put the permanent crown in place. Day of Surgery - Temporary Crown Attached to the Immediate Dental Implant. Temporary crown removed showing the temporary abutment. New temporary crown is cemented on the tooth colored abutment. 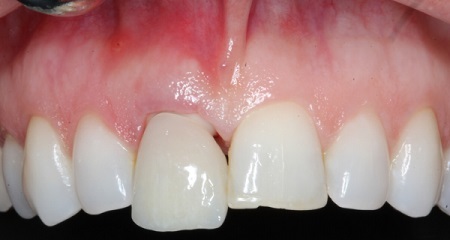 Patient is now ready to go see her family dentist to have custom color match performed and all ceramic crown fabricated. An immediate implant can save months of waiting for your new tooth. It will reduce the number of visits you need to make to the surgery, and the money you have to spend on preparation and surgery time.